The third and last entry in this series addresses three of the cities where citizens are calling for change. I arrived in Boston’s Logan Airport from Chicago in the wee hours of the morning. Not wanting to drive over an hour to my dad’s, only to return to the city where I had business to do, I decided to catch a few hours of sleep in the airport and then head into Boston at daybreak. Quite a few people were sleeping at the airport that night, and I wondered if these great structures, designed to attract and impress the global business traveller especially in the era of cheap energy may end up providing shelter for the multitude, like the Colosseum after its abandonment as a venue for “games”. Boston is rich with such public spaces, many relatively kitsch like the lobbies of 80s office buildings or touristio-commercial Bostoniana theme zones (Quincy Market, Freedom Trail, etc.) but others are just beautiful. In the early morning I freshened up in the (clean and modern) airport rest room, took the (efficient) Silver Line (Bus Rapid Transit) downtown, and strolled out to the end of Aquarium Wharf to watch the sailboats and seagulls (and seals, visible under a beautiful new roof structure in the pool of the Boston Aquarium). 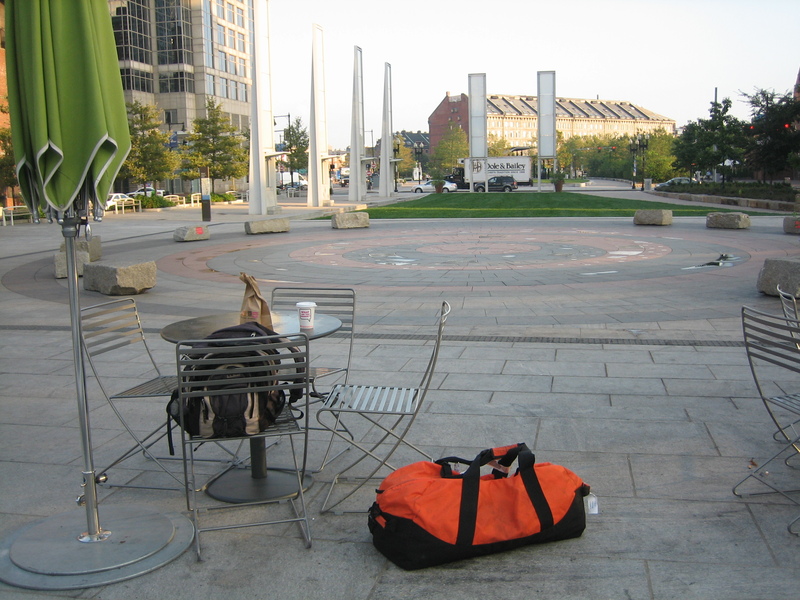 Then, after picking up a coffee and pastry, I had breakfast at a free, public cafe’ table provided by the city in the newly landscaped Rose Fitzgerald Kennedy Greenway. I used my laptop to read the news, check email, and skype my family in Italy, thanks to the free public wifi network. I even got to witness something I rarely see in Rome, one of the few cars I saw, an SUV that briefly parked in a tow-away zone, was loaded onto a tow-truck and removed. And all of this urban splendor part of our collective wealth. In the past week, I’ve followed from afar the Occupy Boston movement which has camped out in this same Greenway and then been evicted. While I hope the demonstrators (and the police) have been careful custodians of the public space, I think such uses are just fine. After all, common space serves everyone, encouraging the kind of messy but transformational action that brings about lasting change. This was true in the Roman Forum of the late Republic, before security forces started substituting it with the more controllable Imperial Fora. It was true in the medieval market squares before Renaissance princes began enforcing their monopolistic control. Today it occasionally seems that the only public forums left are virtual ones, omnipresent social-media where we can decide who to expose ourselves to and who to filter out, leaving physical places as pretty places for office workers to eat their salads. But history (and writers like Hannah Arendt) shows that the “piazza” is always the best place of resistance. A few days after Boston, in Barcelona with my students, I led a walk through the Raval neighborhood teeming with immigrants and their informal economy, phone-centers, prostitution and drug-trade. When, just after walking through the middle of a drug bust, we emerged onto the Rambla del Raval, we watched a group of “suits” in front of the new 5-star hotel. Were they bank managers discussing foreclosures or new real-estate ventures? Were they involved in the global pharmaceutical market, or petroleum companies, or maybe the arms trade? Of course we were only guessing, but someone asked, with reference to the drug-bust across the street, how we knew who the real criminals were here and suggested that, yes, the guys in suits might well be responsible for far greater crimes but at a distance, cloaked in protective layers so that even they themselves might not be aware of their heinous effects. The great thing about the “piazza” is that it makes you ask these questions. While on Facebook you are unlikely to see a homeless person unless you are homeless yourself, in the piazza it’s hard to pretend that everything is okay when it’s not. This is why the work being done by the Occupy Wall Street participants is so inspiring and useful; “making legible the obscure” as Saskia Sassen puts it. I don’t really blame the bankers and brokers for playing the game, getting rich, and insulating themselves from even recognizing the negative effects of the game. The old economic system (and the commercial media that was its mouthpiece) was biased toward this kind of ignorance. Now, thanks to Web 2.0 and the “piazza”, the game is changing and many of those same bankers and brokers to their credit are starting to realize that their actions have consequences beyond their own bonuses and purchasing power. In Rome, the Occupy movement targeted the Bank of Italy on via Nazionale with peaceful and festive protests for a few days, camping out on the steps of the Palazzo degli Esposizioni across the street. As always, the police response created tension, blocking streets and sidewalks, presenting tourists to Rome with a picture of hostility which appeared ridiculous next to the small and highly creative group of demonstrators. Sadly, the exhibition hall, in the past a venue for many interesting shows, instead of welcoming the movement as a truly contemporary expression, a grassroots affirmation of culture in the face of profiteering, opted to shut its doors and turn its back on the movement. On Saturday, as traditional media were happy to report, violence broke out on the streets of Rome. As we know, sensationalism sells and reports of rioting translated into millions of hits on the news sites, where pictures of burning cars and smashed windows shared screen space with ads for new cars and banks and consumer products. When this happens it’s hard not to question where the responsibility lies. Is this really the outcome of pure pent-up rage? The anger is understandable, but I thought those demonstrating were smarter and would avoid falling into the trap of spiraling violence which always plays right into the hand of the forces of repression. Or is this violence perhaps instigated by those very forces of repression? Our gut response to such a suggestion–”come on, don’t be ridiculous”, or, in Italian, “ma, ti pare?”– goes a long way toward explaining just why it would be so effective. Burn a few cars and beat a few underpaid cops and you 1. discredit what is starting to emerge as a truly global uprising on the part of 99% of humanity, (no, not just a few hippies) 2. justify, in the name of public safety, repression of free-expression by those 99% and 3. give a boost to the media and the advertising which now pays its bills. The violence that broke out in Rome this weekend is typical of the old economy where destruction of property, just like wars, diseases and natural disasters, actually show up on balance sheets as positive events because they increase consumption and spending. Most likely what transpired was a combination of raw, ignorant anger and calculated infiltration. Fortunately, in today’s piazza and today’s network the truth tends to surface. Fantastic post, as always. Bravo, bravissimo! Great post Tom. And – having witnessed the entire thing from ground zero in Monti – I am with you 100%. “Or is this violence perhaps instigated by those very forces of repression?” Yes. It was obvious from early in the day when the black block was easily recognizable, to late at night, by 10:30, when they were all calmly strolling home. Again, easily recognizable. And never stopped by the massive forces that was lining the streets that day.